Nowadays, not many families make traditional cakes at their homes because they can order them from shops, which is not really expensive and they can save time for doing other things. But people who live in the countryside maintain that traditional custom for lots of reasons, and the main reason is they have time and space to cook it. 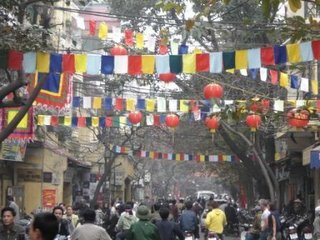 Tet is also the time for family reunions, being together, praying and standing in the queue for putting incense on the altars to commemorate their ancestors. This also is the time for people to visit their neighbors, friends and relatives. 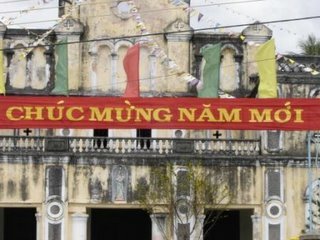 During the first three days, the first person who comes to the house offering Tet greetings is considered as the visitor of the year. 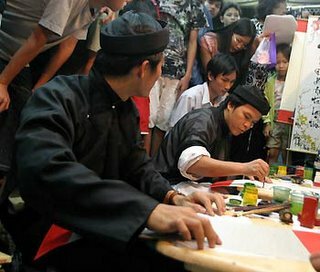 This is very important for Vietnamese because the first person's age affects the family's whole year of doing business or bringing them good or bad luck. Lots of people choose the first person they want to visit their houses and sometime if someone unexpected knocks on their door, they may just ignore them. 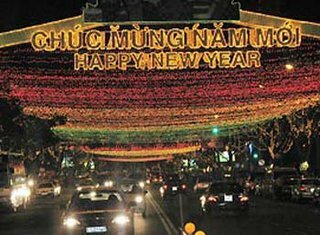 Tet in Viet Nam now has a different atmosphere compared to past years. 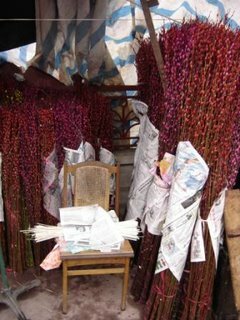 When I was a little boy, on the last 20 days before Tet, every house set off fireworks, as if it was a competition. It was great with lots of noise. But I do agree with the government that the banning of fireworks protects against accidents. Another very interesting and cozy thing on this special occasion is, when you come over to anybody's house, that you should give a little money to the children for luck. This is called Li Xi. All you need to do is put money in a red envelope and wish them luck and health in life and they will wish you the same but in a different, funny way depending on how old they are. This is the most exciting aspect for kids at Tet and they always hang around when they see people come to their houses. You also should give money in the same red envelop for old people with special wishes. It doesn't mean you have to give to everyone or give lots of money, just small money for special luck. That's very interesting & certainly reminds me of house spring cleaning :( Chinese New Year falls on 29 Jan 2006, so I wondering if it's the same as Vietnam Tet? Yup, we are also celebrating Chinese New Year here in the Philippines. Although I am not Chinese, I am exposed to all these Chinese traditions during the New Year. Pretty interesting and very colorful. Wishing you an auspicious and exciting Year of the Dog! Love learning of other cultures. to our house. Again,similar to Li Xi, we do have the tradition of giving money to childern and to old people,which we call as Vishukani. Hope you had a great shopping for Tet. That's really cool and it's great that the Lunar New Year has more of a community feel and is about spending time with family & friends, because in America people just go out and get drunk for New Year's Eve. Wonderful photos! Like i said before, your blog is always an eye opener to me. Yes slurp, same day mate. aarya, I am more than happy reading your post and leaving comment as you do, thanks. Winn, you are suc a sweet sweet fellow. Crystal, why don't you make a trip to asia during lanar new year, such a great time. I am sure that you'll enjoy it. i can almost smell the festive spirit in the air...just like chinse new year...in our traditions..the eve is for reunion dinner...unfortunately as children are grown up...with their own families and things to do..it's pretty rare even on a normal day to have a simple meal together..crackers were banned in Singapore for a long long long time ago..sigh..anyway this year im going home to celebrate the chinese new year with my mum...one week on leave.. This is the first time I celebrate Chinese New Year in America. I am Vietnamese and I move to America to study as an international student. I miss everything I did in the Lunar New Year day. 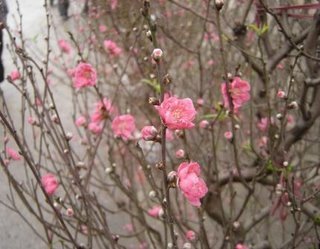 Here, all I can do is to buy some fruit and flowers to say a prayer. No one knows about the Lunar New YEar. I have to study right after I say a prayer. No banh chung, cu kieu, tom kho, no lucky money... nothing. My assignment now is to write about my memory. I choose the Lunar New Year because I know, it is a part of me wherever I am. my friend and i communicate 3-4 times a week via IM.